Understanding the caster life cycle allows you to plan proactive care or replacement into your maintenance programs to reduce or eliminate risks. Caster failures can do a number to you and your business. The cost to replace a caster isn’t the only price you will be paying. Improper care for casters may lead to inventory damage, increase product breakage, interrupt product flow, or even put workers at risk of injury. Remember to change your casters at certain intervals. This will help you avoid loss of machinery or carts that create downtime. If you know anything about plating, you’ll know that zinc is generally the first step in the plating process. Many products are first zinced before being finalized with such finishes such as copper, nickel and chrome. These types of platting provide additional durability that can offer more protection against corrosion to the rig. The ultimate solution in this situation would be to go strictly with a stainless steel rig. It is important to understand that is not going to be stain free, but it will give you many more years of service and a better presentation of your product. Nobody likes to look at their equipment or have visitors or inspectors coming to your facility seeing rust and corrosion. It presents a bad image and reflects poorly of the fundamental operation of your facility, when it is something that can be prevented easily by using stainless steel. There are no certain timelines on how long casters will last. Caster durability varies by use. There are a variety of factors that contribute to the lifespan of a caster. Materials are one of the factors that affect casters. 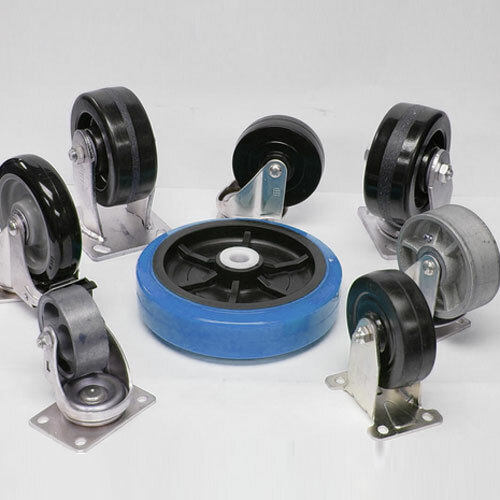 The more contact casters have with water, corrosive liquids, air, etc. the shorter its lifespan. Caster life cycles can be extended with a couple tips such as proper caster maintenance and making sure you have the right caster for the job. For more information on stainless steel casters or if you’d like to schedule a caster maintenance fill out the form below and one of our caster specialists will assist you as soon as possible.